The Blue Ensign of Kenya, used between 1921 and 1963 was a traditional blue ensign with the Union Jack in the upper left corner and a blue background. The fly contained a red lion standing on its hind legs. I found three flags and a badge of the Kenya colony without much explanation in Kannik's Vlaggen, Standaarden en Wapens (n.d.): The blue ensign has the red lion without the white disk. The lion is "red ensign red". The other two flags are: Governor of Kenya and the Merchant flag of Kenya - red ensign with lion in the fly in a white disk. 1890-1895. "Crown/sun badge" on white disc surrounded by garland on Union Jack. Variation of badge on Red Ensign and Blue Ensign direct. 1895-1921. "Red lion badge" on white disc on Blue Ensign. 1921-1963. Ditto on Blue Ensign direct. One of my Vexillology class students noticed that some defacements on British ensigns are placed on the lower part of the fly half as opposed to the middle. It seems to me that it was a more common practice in the early 20th century even though there are current samples of this defacement method. Can anyone shed light on this? Has it traditionally been a manufacturers option, or were/are there specific times when defacements are lowered? I have attached a Kenyan red ensign (shown below) made from a picture that I have in a book. If anyone owns a copy of Dhows of Mombasa, there is a very nice turn of the 20th century picture of a British East African dhow flying the "Kenyan" red ensign with the defacement in the lower fly. The ensign appears to be perhaps 3x6 feet. The centre of the fly has been the correct official position for the badge on most British ensigns since 1869. The exceptions are yacht club special ensigns. I have never seen a specific instruction about the position of the badge on these ensigns and I think that some clubs have tended to place their badge in the fourth quarter. It is an unofficial flag anyway. No Red Ensign warrant was issued for Kenya, nor for the British East Africa Protectorate, which was the name of the territory until 1920. There was a Red Ensign warrant for the Imperial British East Africa Company, but that was a different badge, and was cancelled in 1901. There's a pragmatic reason for placing badges in the lower fly; that being that they are much easier to see in almost any circumstance. This may have been why manufacturers opted to deface ensigns this way despite official specifications. The Kenyan red ensign with the lion is another prime example of a "non-existent" red ensign that was manufactured and used in abundance. The flag itself was not illegal. The legality of its use as an ensign would have depended upon the circumstances. It would not have been a legal ensign for a registered ship, and its use in international waters would have been open to question, as it was not an internationally recognized maritime flag. But there was no reason why small dhows, trading along the East African coast, and generally remaining within the territorial waters of the British Empire, should not use it as an ensign, if they so wished. It may locally have been thought that it was the correct ensign, since British Somaliland to the north, and Tanganyika to the south, each had its own warranted Red Ensign. They were a protectorate and a mandated territory respectively, whose inhabitants were not British subjects, and were therefore not entitled to use a plain Red Ensign. It might be argued that Kenya also should have had a distinctive Red Ensign. Although the interior of the country was a colony after 1920, the coastal strip, formerly known as Witu, remained a protectorate. This caused a problem in 1956 when the Board of Trade Registrar in Plymouth refused to register a ship belonging to Southern Lines Ltd of Kenya, on the grounds that the company's head office was in Mombasa, which was in the protectorate and not the colony. The ship could not sail under the Kenyan Ensign, since such an ensign had not been warranted, and it could not sail under the plain Red Ensign as the ship was owned by a company that was not "established under and subject to the laws of some part of HM dominions." The company was advised to either transfer ownership of the vessel to another company, or register it in the name of a British subject, or move its head quarters to Nairobi, which was within the colony. Source: National Archives (PRO) BT 239/148. The flag of British East Africa is the national banner of the Empire, bearing upon the intersection of the crosses a red lion, rampant, or aggressively walking forward on his hind legs...encircled by a wreath. No explanation why British East Africa doesn't follow the badge-ensign model. We have no information on this briefly (if ever) used flag. From Flags of The World by Bill Yenne, Published by Bison Books, 1993 [ynn93]. 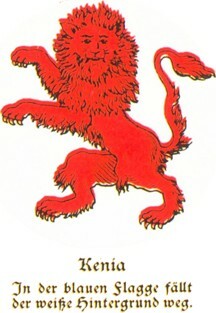 The famous, and very poorly drawn (Heraldically speaking) Red Lion which defaced the British Blue Ensign of what was British East Africa, and then later Kenya, adorns several flag plates in publications of the highest quality through the ages. We seem to have "settled" on the version from Flaggenbuch [neu39], which in turn, derived the drawing from the British Admiralty one presumes. David Prothero scanned another version which, would appear to have come from BR20, 1958 [hms58] and the detail of this beast has some differences from the "standard" Kenya Lion. His paws are accentuated whilst his face and main show a greater amount of detail than the British vexillological enthusiast has become accustomed to by familiarity. From scratch, I decided that this alternative rendering would be worth a drawing. I depict the detail on a blue field here below, although the white disk was dropped later and therefore the Lion placed directly on to the fly of the Blue Ensign. Martin Grieve commented that he believes the badge I drew was inspired by the "Kenia" badge in the 1939 Flaggenbuch [neu39]. I have posted that badge for everyone's benefit. of Flags of Maritime Nations. As you all can see, my badge, is not that similar to Flaggenbuch's badge. II love and appreciate all the various editions of Flaggenbuch, but have never considered them to be all that credible when it comes to showing exact illustrations of British badges. They're functional, but not spot on. defaced directly onto the fly of the ensign. In both cases, they very closely match the lion I have already posted to FOTW. I did take a few very slight liberties in modifying the black shadowing in the lion. Otherwise, the lion would not have been very recognizable on a blue background. Other than that, the badge is a faithful reconstruction of what I was sent. I am aware that there was perhaps one late change (Martin's reference) in Admiralty art work where Kenya's lion was concerned, but I'm not certain that the change translated into a different lion ever defacing Kenyan ensigns in large numbers. Having said that, Bruce Berry does have a Kenya blue ensign with Martin's basic drawing as a defacement. I have also attached that picture in the files section. Bruce's ensign was manufactured by William Smith in Salisbury (Rhodesia) some time back when. It's the only such ensign I have ever seen. It seems that the "Red Lion badge" was never warranted for use on the Red Ensign, and is an error. There was an earlier badge for British East Africa, that of the Imperial British East Africa Company. Hulme, in Flags of the World [hul95a], published in about 1895 wrote: "British East Africa has the crown and beneath it the golden sun shooting forth its rays, one of the simplest, most appropriate, and most pleasing of all the colonial devices; when placed in the centre of the Governor's flag it is upon a white disc, and the sun has eight principal rays. When for use on the red or blue ensigns, the sun has twelve principle rays and both golden sun and crown are placed directly upon the field of the flag." The Admiralty Warrant of 6th March 1890 for a defaced Red Ensign is for this badge. The protectorate was proclaimed in 1890 and administered by the Company until 1895. This suggests that the badge, as a flag defacement, went out of use in 1895. The date of the amendment which inserts the "red lion badge" into the Admiralty Flag Book (June 1896) then makes more sense. Thus the "red lion badge" was never warranted. It didn't need a warrant for the Union Jack or Blue Ensign, but it would have needed one for the Red Ensign. The earliest book that I have found, that shows the "red lion badge" on a Red Ensign is the NGM of 1917 in which it is the only colonial (as opposed to Dominion) badge that is shown in place on all three flags, the Union Jack, the Blue Ensign and the Red Ensign. This has been copied by Kannik in the Flag Book/Handbook of Flags of the 1950's [kan58]. The 1934 National Geographic Magazine shows only the badge with the text: "Kenya displays a red lion rampant guardant on its badge. It is used as illustrated on the Blue Ensign, and on the Union Flag it is displayed on a circular white disk and surrounded with the regulation laurel wreath." Wheeler-Holohan in Flags of the World (1939) [hol39] wrote: "Whoever designed the badge of Kenya was no heraldic artist, for it is a very poor specimen of a lion rampant guardant in red. On the Blue Ensign it has no white background, but when shown on the Union Flag the background is encircled with the garland." This is repeated word for word in the 1953 edition by Gresham Carr. Letters of the early 1920's in the Public Record Office, about whether or not colonial badges were displayed in a white circle, make no mention of a Red Ensign for Kenya. However they indicate that the "red lion badge" was displayed on a white circle on the Blue Ensign until 1921. It seems that the "Red Lion badge" was never warranted for use on the Red Ensign, and is an error. The earliest book that I have found, that shows the "red lion badge" on a Red Ensign is the NGM of 1917 in which it is the only colonial (as opposed to Dominion) badge that is shown in place on all three flags, the Union Jack, the Blue Ensign and the Red Ensign. This has been copied by Kannik in the Flag Book/Handbook of Flags of the 1950's. 1890: Kenya became a British territory as the East African Protectorate. 1891: It was administered by the Imperial British East Africa Company. 1895: Put under the control of the Foreign Office which appointed a Commissioner. 1905: Control of the territory was transferred to the Colonial Office. 1906: A Governor was appointed. 1920: Part of the mainland territories of the Sultan of Zanzibar became the Protectorate of Kenya, and the remainder became Kenya Colony. Known officially as the Colony and Protectorate of Kenya; in brief as Kenya.